What low cost drone do you recommend for an older child? This question was answered on December 16, 2015. Much of the information contained herein may have changed since posting. Drones, also known as quadcopters or UAVs (Unmanned Arial Vehicles) are expected to be one of the hottest holiday gifts this year. There are dozens of manufacturers of lower cost devices that look a lot like the expensive models from companies like DJI, but they don’t operate the same way. An important thing to understand is that despite them often looking like toys, they’re really not and shouldn’t be treated as such. Keep in mind, there’s a bit of a backlash against UAVs from those that don’t own one, so it’s really important that you fly responsibly and in areas where others don’t perceive you to be ‘spying on them’. 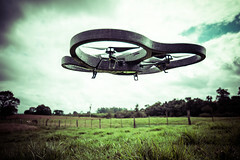 In fact, a recent FAA ruling will require all UAV owners to register their devices starting on December 21st, 2015 with potential civil and criminal penalties if you don’t: http://www.faa.gov/uas/registration. Any flying craft that’s controlled by a transmitter that weighs .55 pounds up to 55 pounds will be required to be registered with the FAA, so this includes traditional fixed wing model aircraft as well. Another thing to consider is liability insurance as a large number of first time pilots experience less than perfect flights in the early going. One way to get specific liability coverage for a UAV is by becoming a member of the Academy of Model Aeronauticshttp://www.modelaircraft.org, which provides up to $2.5 million in persona liability coverage. Low cost UAVs generally have a much shorter battery life (5-8 minutes) and a much shorter flight range (typically @100 feet), so understanding these limitations is also critically important. They’re also generally very light, so they don’t do very well in windy conditions either. As long as parents and beginner pilots understand how and where to fly their craft, they can be very enjoyable and safe. One of the more popular UAVs for beginners is the UDI 818A which is both durable and has protective rings around the propellers. There are several models that have different camera options that range from standard resolution to HD video and sell for $70 to $160. The more expensive model, the UDI 818A HD+ has the HD camera as well as the ‘return home function’ and advanced controls that makes flying the device much easier. Less expensive options like the Syma X5SW (@$60) that have the FPV (First Person Video) feature, which streams live video back to a smartphone seem attractive, but there are drawbacks to consider. The video quality is pretty low and the delays in the real-time video make the FPV feature less useful. FPV can also be distracting, because the pilot can lose sight of where the craft is in the air, which can result in the battery running out before you figure out where it went. Regardless of which model you purchase, make sure you buy at least one extra battery (they often take 2 hours to recharge and only last a few minutes) and extra blades for the inevitable broken prop scenario.